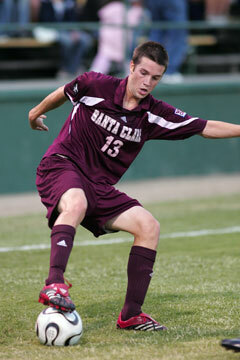 Keith DeVey, who prepped at St. Anthony, has scored 15 goals for Santa Clara in his career, six of them game-winnners. A bicycle kick by Keith DeVey was all that stood between him being cut as a freshman and putting together a standout career for the Santa Clara Broncos men's soccer team. 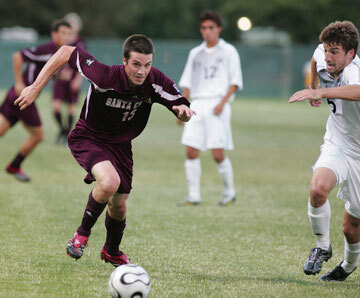 An All-State performer in soccer and track at St. Anthony as well as being on the tennis team, DeVey was a walk-on at SCU in the fall of 2002 after considering most of the other West Coast Conference schools. "Keith was playing for the Santa Clara Sporting Club, was familiar with the area and felt comfortable here," said SCU coach Cameron Rast. "We weren't sure he would be able to adjust to the college level, but he made adjustments." There comes a time each fall when the coaches have to decide who to keep and who to let go. DeVey was on the cusp of just being a student instead of a student-athlete. "There was one play I recall when he was on the verge of getting cut. He was out on the edges and he made this unbelievable bicycle kick," Rast said. "It was one of those moments. We just said if he had the ability to try something like that, then this was a guy we had to take a chance on. Keith never looked back and has played well ever since." DeVey, primarily a striker who occasionally drops back into a midfield position, has started 24 of 58 matches for the Broncos. He has taken 60 shots and has scored 15 goals, including six game-winners. DeVey scored his sixth game-winner and first of the 2006 season last Friday with a volley shot at 33:36 in a 4-1 SCU (4-0-1) victory over St. Louis. The 5-foot-10, 160-pound DeVey says one of his strengths is the knack for being in the right space at the right time. "I have a knowledge of where the gaps are in the defense, where I can easily receive the ball and where I can just turn and shoot," said DeVey. Rast added, "That is not an easy skill to develop, Keith just understands the other players' momentum and where they are going." DeVey missed matches his redshirt freshman year and again last year with a left hamstring injury. "I did a lot of work with a flexibility coach this past summer and hope to avoid that injury this year." said DeVey who otherwise takes the summer off to enjoy some time away from soccer. He likes to start a match, but also says coming off the bench has its benefits. "I prefer coming off the bench after the first 15 or 20 minutes go by. Those first minutes can be frantic and hectic and sloppy and nothing is getting accomplished," DeVey said. "It gives me time to plan what I want to do on the field when I go into the game." "Keith is particularly effective off the bench and you can't say that about most players," Rast said. "He has a good sense for what will happen in a game and it is not easy to find a player like that." DeVey says he has never really been nervous playing soccer, never been afraid and doesn't mind pressure situations. "I never doubt my abilities. I think that helps late in the game," he said. Rast said, "Keith is pretty intense when he competes, but he is pretty laid back off the field, coming from Maui. The guys love him for that. He works hard and is always fit. He is just a good good teammate." In his fifth year at Santa Clara, DeVey says he feels like the old man on campus. "I don't recognize anyone any more. The time has gone fast, but it definitely has been a fun experience," DeVey said. "I'll be done with soccer here in a few months and I hope to have that go well." The St. Anthony graduate says he is a six-month, goal-orientated person. "Keith attended an alumni function (on Aug. 22) and was asking everyone about jobs. He is a sharp, sharp young man," Rast said. DeVey has worked the last seven months at a high tech public relations firm. His interest is in high tech public relations or marketing. "When I'm done I will have a (communications) degree from a good school and hope to get a job in Silicon Valley," DeVey said. "If there is an opportunity in pro soccer, I would be willing to give it one shot to see what happens, but I'm not going to hang around." He lists three career highlights. Two occurred in back-to-back matches last year when he scored the game-winning goals against UCLA and Cal State Fullerton. "That was just an amazing thrill to be picked as one of the best players in the nation for a week. I never thought I would get that recognition," DeVey said. The third highlight was going to the College Cup, playing in a Major League Soccer stadium (Columbus, Ohio) and having the match on ESPN. "That was a huge game. It will stay with me the rest of my life," DeVey said.